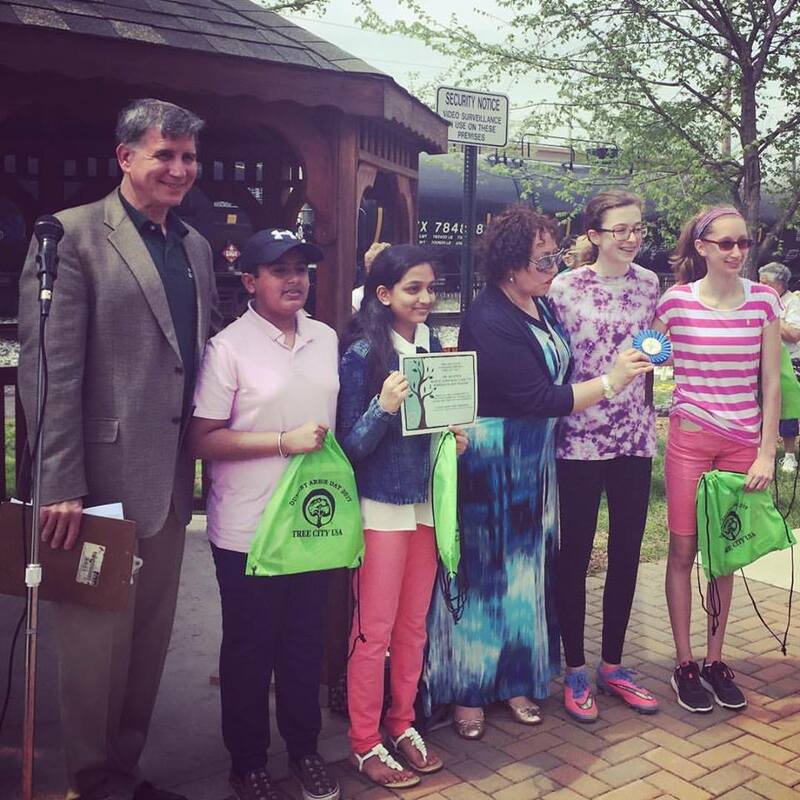 Thanks to the residents, art contest participants, elected officials, friends, and commissioners for a wonderful Arbor Day 2017. It was Dumont’s 12th straight year of sunny skies that helped make the day amazing. It began with our Flag Raising Ceremony thanks to Boy Scout Troop 64 with Scout Leader Sal Maurice. Our National Anthem was sung beautifully by Ms. Emma Brennan. Mayor James Kelly issued the Proclamation of Dumont Arbor Day. We are grateful to our supporters which include the generosity of Visions Federal Credit Union and Mariner’s Bank. Also present were our Councilmen Carl Manna, Rafael Riquelme, and Don Morrell along with our DSTC Liaison Lou DiPaolo. This years 2017 Arbor Day Award of Merit was presented by Commissioner Abbie Slaman to a very deserving Anna Fisichella for her tireless work as our Master Gardener at the Arboretum. We honored the gift of the new Arboretum bench by Tom Fisichella, Bill Zitelli, and Joe Ulrich . We thank all the participants and Art Contest Winners for their contributions of poetry, sculpture, and drawings that celebrate our urban canopy. The day culminated with the acceptance and planting of the new Kentucky Coffee Tree on behalf of the Borough of Dumont. The annual Tree Planting Ceremony had our children, council, and commissioners picking up shovels taking turns to plant the tree.